Uranus’ thermal behavior is different from that of the other Jovian planets Jupiter, Saturn, and Neptune. It emits significantly less intrinsic energy than these other planets, and the actual net intrinsic emission may be zero. Naturalistic explanations have failed so far to explain this anomalous thermal behavior. The implications of this fact for special creation continue to be confirmed by modern data. Prior to the beginning of the Space Age with the launch of Sputnik in 1957, it was relatively easy to generalize planetary properties to make them appear explicable by evolutionary planetary origins models. The return of Space Age data from planetary flybys, however, has repeatedly contradicted these models. One major contradiction involves the properties of the Jovian planets. Rather than showing the similarities expected by evolutionary theorizing, these planets have emerged as distinctive, even unique, in ways which evolutionary theorizing cannot explain. During Creation Week God spoke into existence the celestial bodies, including the planets (Genesis 1:14–18). Because the planets did not evolve from a common source, but were individually or ‘specially’ created, there is no fundamental requirement that planets must show predictable similarities, although certain patterns of similarity do exist. Special creation permits the possibility, and even leads to the expectation, that there might be differences among the planets, which are inexplicable by any evolutionary model of development. The distinctives, which have been observed for the planets, would therefore seem to be evidences of special creation. One distinctive is Uranus’ thermal behavior, long recognized as a difficulty for planetary evolution models. Such models typically assume a primordial heat source resulting from planetary accretion, or postulate the production of internal heat from processes such as gravitational contraction or phase separation. Given that the Jovian planets allegedly evolved along similar lines, one would expect that they would all show similar thermal behavior today, or would at least show a pattern of change from one planet to the next. This is not the case. Uranus especially exhibits a thermal behavior that stands out from the other Jovian planets, and creationists have long cited this fact as evidence for special creation. ‘Neptune … suffered a collision late in its formation that stirred the ice and rock of its interior all the way to the center. That mixing helped break down the stratification that would otherwise have greatly inhibited the heat-driven vertical circulation that now carries heat to the surface. Even of Jupiter and Saturn, the two Jovian planets most often assumed to have been successfully modeled, it has been written that ‘all the models of Jupiter (and Saturn) until now are basically incorrect’,5 and that ‘existing models for the Jovian interior need to be revised.’6 Recent studies have not changed these conclusions. If Neptune’s heat were indeed from radioactivity, this could imply the presence of elements there which Uranus does not have, making a stronger case for the planetary uniqueness of Uranus, and in turn a stronger case for special creation. All planetary interior models are totally ‘theoretical’,12 representing conditions that ‘cannot be replicated in laboratories’13 in which internal element abundances can only be estimated. It is nevertheless significant that at most only 15–20% of Uranus’ internal energy is estimated to be from radiogenic heating.14 The actual radiogenic contribution may be even less than this. Aside from the marked thermal difference between Uranus and Neptune, these two planets differ from the other Jovian planets in several other (related) ways: (1) relative abundance of hydrogen and helium, (2) abundance of heavy elements, (3) density profiles, (4) internal structure, (5) degree of homogeneity, and (6) temperature profiles.15 It also appears that Uranus is significantly different from Neptune in at least the last two characteristics just mentioned.15 Rather than being revealed as more like each other, the Jovian planets are emerging as increasingly dissimilar as research progresses. The blackbody temperatures T in Table 1 have been computed by NASA using the quantity S(1 - Î±) and the Stefan-Boltzmann equation.19 This is apparent from the nearly constant ratio (not shown in Table 1) between S(1 - Î±) and the fourth power of T for each planet. We could compute fictitious energy emission rates H using the given blackbody temperatures. These values of H, in the fourth column of Table 1, are not real, because they do not include thermal emission due to intrinsic luminosity, i.e. internal heat sources. However, if we compare S(1 - Î±) and H for each planet as in the last column of Table 1, we get nearly constant ratios, with very little difference for any planet from the others. If we (wrongly) drew conclusions about planetary intrinsic luminosity from these ratios, we could conclude that Uranus shows thermal emission behavior no different from the other three giant planets. In 1984, prior to the Voyager missions to either Uranus or Neptune, Hubbard20 provided values of planetary ‘effective temperatures’ for the giant planets computed via the Stefan-Boltzmann equation using intrinsic luminosity and thermal luminosity. These are given in Table 2, along with NASA’s current blackbody temperatures repeated from Table 1, and the blackbody temperatures as they were known in 1984. Uranus is the only planet of the four in Table 2 whose effective temperature and blackbody temperature are nearly matched. For the other planets, the excessive effective temperatures mean that they are radiating more heat than they receive from the Sun. As of 1984 the radiation of Jupiter and Saturn had been analyzed by Voyager 2, so it is not surprising that the 1984 blackbody temperatures for these two planets agree so well with the current values. What is surprising, however, is the agreement between the 1984 and current blackbody temperatures for Uranus and Neptune. In 1984, as Hubbard notes,21 ‘the values of A [used to compute blackbody temperatures, were] obtained from theoretical models’, yet they agree well with the current values. The reason for this surprise is that ‘it is normally necessary to perform this important measurement from a spacecraft, because when we observe a distant outer planet from the Earth, we see only the component of the sunlight which is scattered back in the Earth’s and Sun’s direction.’21 With this theoretical precision existing for A, it would appear also that the intrinsic luminosities for Uranus and Neptune were predicted accurately in 1984, and from them the effective temperatures given in Table 2. In summary, Uranus’ distinctive thermal behavior was well-known before the Voyager flyby, and as discussed in the previous section, was recognized both as a difficulty for evolutionary modeling and as an evidence for special creation. In a modeling study attempting to resolve ‘the still uncertain and debated questions about … the origin of [Jupiter’s] excess heat’,22 the ‘observed excess heat’ for each Jovian planet was compared with the heat hypothetically released by a process of deuterium-deuterium (D-D) fusion in the Jovian planet interiors.23 The authors of this study, Rachid Ouyed and colleagues, concluded that their model ‘might be applicable to the family of the Jovian planets as a whole’,24 a conclusion which presumes a parallel evolutionary history for each of these planets. Table 3 presents ratios of total emitted power E to total absorbed power A for Jupiter,25 Saturn,26 Uranus,27 and Neptune2 as utilized in the D-D fusion study.28 The second column of Table 3 lists the ratios E/A. The relative difference E - A is expressed as a percentage in column three. The quantity (E - A)/E is the fraction of excess energy emitted, and is shown in the fourth column as a percentage. The right hand column lists E/A ratios computed from the Hubbard 1984 blackbody temperature and effective temperature data in the second and fourth columns of Table 2. The 1984 ratios of E/A for Jupiter and Saturn derived from Table 2 agree with those utilized by Ouyed et al. This would be expected since Hubbard’s 1984 ratios for Jupiter and Saturn, like those of Ouyed et al., post-date the Voyager flybys of these two planets. For Neptune, there is not agreement of the Hubbard 1984 E/A ratio with that of Ouyed et al. This is because the value of E for Neptune during the 1989 Voyager flyby turned out to be larger than estimated by Hubbard. Thus, Neptune is even more different thermally from Uranus than had been anticipated in 1984. The conclusion that Uranus is thermally distinctive from the other gas giants has been strengthened rather than weakened by post-1984 data. As for Uranus, the E/A ratio from Table 3 is approximately unity. Indeed, Ouyed has stated that, ‘It seems that the giant planets emit more energy than they receive from the Sun … . Uranus seems different in that respect since the ratio is very close to 1.0.’28 The long-standing problem posed for evolutionary models by Uranus’ thermal behavior continues. Uranus is virtually always regarded as an anomaly which evolutionary models cannot explain. Pearl and Conrath2 write that ‘ground-based and spacecraft observations have revealed large excess energy fluxes from Jupiter, Saturn, and Neptune but a very small excess from Uranus’, noting a few lines later that there may be ‘no energy excess.’ These same authors conclude elsewhere that ‘the full implications of the small internal energy source of Uranus remain to be established’,14 a conclusion echoing the serious problems posed by this phenomenon for planetary evolution. Pearl et al. state that the ratio of emitted to absorbed energy, E/A, for Uranus is 1.06 Â± 0.08.14 It is significant that the range of uncertainty (Â± 0.08) in this figure is so great that it includes values even less than unity. In other words, Uranus is emitting at most only a relatively small fraction of excess heat, and may be emitting no excess heat at all. With this realization, it is evident why Ouyed, as quoted above, said that the E/A ratio for Uranus is ‘very close to 1.0’,28 and why astronomer John D. Fix has stated, ‘The temperature of Uranus’ atmosphere is consistent with heating only by absorbed sunlight … .’30 Yet the claim is sometimes made that all the Jovian planets ‘give off more heat than they receive.’31 This type of statement minimizes the fact that even if an excess exists for Uranus, it is insignificant by comparison with that of the other gas giants, as we will now see. From Table 3, the E/A ratio for Jupiter is 1.67, giving an excess energy fraction of 40% in column four. This contrasts with only 6% (at most) for Uranus.14 Thus Jupiter’s excess emission fraction is at least 40/6 â‰ˆ 7 times the excess emission fraction of Uranus. Saturn and especially Neptune are even more dissimilar from Uranus. Saturn’s fraction of excess energy is 44/6 > 7 times that of Uranus, and for Neptune it is 63/6 > 10. Uranus’ thermal behavior is simply not the same as that of the other gaseous planets. Indeed, Uranus and Neptune, both commonly paired in evolutionary origins discussions as if they were somehow the most similar of the gas giants, are actually the most dissimilar in their thermal balance of any of the Jovian planets. It is no wonder that Fix, after emphasizing Uranus’ lack of excess energy, immediately points out that ‘Neptune is significantly warmer than it would be if it were heated by sunlight alone’, a statement which he amplifies later by writing, ‘60% of the energy emitted by Neptune comes from internal sources.’32 This figure of 60% is a rounded value of (E - A)/A for Neptune listed in the fourth column of Table 3. This 70% figure for excess heat emitted by Jupiter and Saturn corresponds to the E - A differences in the third column of Table 3. Of course, these values had already been obtained through earlier Voyager flybys of Jupiter and Saturn, which pre-dated the Uranus flyby of 1986. But the pre-1986 estimate of 30% excess heat from Uranus corresponds to an emission/absorption ratio of 1.30. Thus the 1.06 ratio computed from the Voyager 2 flyby data was much less than the prediction. This has been described consistently as an anomaly. To illustrate this last statement, several assessments are discussed below which post-date the Pearl et al. paper reporting the 1.06 ratio. This ratio never seems to be merely mentioned. Rather, sources typically dwell on how low it is. An article in the journal Science describes it as ‘so small.’15 It does not seem to be at all typical to dismiss this ratio as unimportant or somehow similar to the ratios for the other gas giants. ‘Uranus is different from the other giant planets in that it is not radiating a significant amount of excess internal heat … . The ratio of total power radiated to total power absorbed is between 1.00 and 1.06 for Uranus. (The equivalent ratios for the other giant planets are greater than 1.7). Thus the internal heat source on Uranus is no more than 6 percent of the power absorbed. The small terrestrial planets generate relatively little internal heat; the comparable number for the earth is only 10-4. It will be shown that this second view is erroneous. No new research has emerged which suggests that this second view is correct. Furthermore, leaving this view uncorrected can lead to misconceptions about the thermal behavior of Uranus, an outcome which has already occurred as we will see. Since Ouyed has in fact acknowledged that Uranus’ E/A is essentially unity,28 and the distinctive thermal behavior of Uranus has often been acknowledged by others, how is it possible to reach the opposite conclusion, that Uranus’ thermal behavior is like that of the other Jovian planets?31 The source just quoted apparently followed Ouyed’s lead in this matter, for Ouyed, though acknowledging the distinctiveness of Uranus’ thermal behavior, nevertheless also minimizes this conclusion, opining that, ‘Not everyone believes these numbers—that’s why they should be taken with a grain of salt.’28 Why would Ouyed make such a statement? The reason cannot be that these numbers are doubtful, for as we have seen, Uranus’ anomalous thermal behavior has been widely recognized. In short, Ouyed has proposed a model to save the evolutionary age which even he admits doesn’t work, but then acting consistently with his evolutionary framework, he has belittled the problem posed for evolution by Uranus. The dismissive view of Uranus’ thermal behavior quoted above31 then echoes Ouyed’s minimizing of the importance of this phenomenon. Fix has said of the Ouyed et al. study: ‘Given their hypothesis that all the giant planets have D-D fusion going on in them, it would certainly be convenient for Ouyed et al. to have a self-luminous Uranus.’40 Thus Ouyed et al. minimized the thermal anomaly of Uranus not because the data demanded it, but to make their D-D fusion model apply consistently to all the Jovian planets. Aside from the scientific inaccuracy of treating Uranus’ thermal behavior like that of the other gas giants, there is the problem of misinformation caused by this erroneous position. Here we have the emergence and growth of a myth. The technical paper in Science barely mentions Uranus, then the matching Science news piece links Uranus with Neptune more strongly (though without reference to thermal behavior), and finally Sky & Telescope picks up on the Science news piece and extrapolates the Uranus/Neptune linkage to a total similarity in thermal behavior. This may be amusing, but it is not science. Instead, this is an example of how facts get distorted because of the influence of false assumptions, in this case the presumption that Uranus and Neptune have evolved almost identically. Uranus is not emitting excess heat in a manner quantitatively similar to the other Jovian planets. There may not be even a qualitative resemblance, for Uranus may possibly be emitting no excess heat at all. Uranus is ‘different’ in its thermal behavior from the other gas giants—different to the point of being distinctive. Uranus continues to be recognized as unique, and the thermal behavior of Uranus continues to be a valid evidence for special creation. Steidl, P.M., Planets, comets, and asteroids; in: Mulfinger, G., Design and Origins in Astronomy, Creation Research Society, Norcross, GA, p. 100, 1983. Return to text. Pearl, J.C. and Conrath, B.J., The albedo, effective temperature, and energy balance of Neptune, as determined From Voyager data, J. Geophysical Research 96(October supplement):18921–18930, 1991; p. 18921. Return to text. Kerr, R.A., The Neptune system in Voyager’s afterglow, Science 245(4925):1450–1451, 1989; p. 1450. Return to text. Pearl and Conrath, Ref. 2, p. 18930. Return to text. Guillot, T., Chabrier, G., Gauthier, D. and Moriel, P., Effect of radiative transport on the evolution of Jupiter and Saturn, Astrophysical Journal 450:463–472, 1995; p. 470. Return to text. Alavi, A, Parrinello, M. and Frenkel, D., Ab initio calculation of the sound velocity of dense hydrogen: implications for models of Jupiter, Science 269(5228):1252–1254, 1995; p. 1252. Return to text. Gentry, R.V., Creation’s Tiny Mystery, Earth Science Associates, Knoxville, pp. 29–32, 1992. See also Gentry, R.V., Fossil alpha-recoil analysis of variant radioactive halos, Science 160(3833):1228–1230, 1968; and Gentry, R.V., Ion microprobe confirmation of Pb isotope ratios and search for isomer precursors in polonium radiohalos, Nature 442(5414):282, 1973. Return to text. Ouyed, R., Fundamenski, W.R., Cripps, G.R. and Sutherland, P.G., D-D fusion in the interior of Jupiter? Astrophysical Journal 501:367–374, 1998; p. 369. Return to text. Nellis, W.J., Ross, M. and Holmes, N.C., Temperature measurements of shock-compressed liquid hydrogen: implications for the interior of Jupiter, Science 269(5228):1249–1252, 1995; p. 1251. Return to text. Hubbard, W.B., Planetary Interiors, Van Nostrand Reinhold, New York, p. 263, 1984. Return to text. Normille, D., Experiment uses nuclear plants to understand neutrinos, Science 284(5422):1911, 1999. Return to text. Nellis et al., Ref 9, p. 1249. Return to text. Ouyed et al., Ref. 8, p. 368. Return to text. Pearl, J.C., Conrath, B.J., Hanel, R.A., Pirraglia, J.A. and Coustenis, A., The albedo, effective temperature, and energy balance of Uranus, as determined from Voyager IRIS Data, Icarus 84:12–28, 1990; pp. 12, 27. Return to text. Guillot, T., Interiors of giant planets inside and outside the Solar System, Science 286(5437):72–77, 1999; p. 74. Return to text. H is the energy emission rate computed using the Stefan-Boltzmann equation with emissivity = 1.0. H does not include any internal energy sources. Return to text. The irradiance S in column 1 is the inverse square value for solar radiation at the semimajor axis distance. It applies only at the point on the planet directly facing the Sun, and is four times the average radiation received over the planet, whereas H is a planetary average. Thus the ratio is 4, not 1, as would be true if S, like H, were an average. Return to text. Hubbard, Ref. 10, pp. 114–115. Return to text. Hubbard, Ref. 10, p. 116. Return to text. Hubbard, Ref. 10, p. 115. Return to text. Ouyed et al., Ref. 8, p. 367. Return to text. Ouyed et al., Ref. 8, p. 373. Return to text. Ouyed et al., Ref. 8, p. 374. Return to text. Chabrier, G., Saumon, D., Hubbard, W.B. and Lunine, J.I., Astrophysical Journal 391:817–826, 1992; as cited in Ouyed et al., Ref. 8, p. 373. Return to text. Podolok, M., Hubbard, W.B. and Pollock, J.B.; in: Levy, E.H. and Lunine, J.I. (Eds), Protoplanets III, University of Arizona, Tuscon, p. 1109, 1993; as cited in Ouyed et al., Ref. 8, p. 373. Return to text. Podolok et al., Ref. 26, p. 1113. Return to text. Ouyed, R., personal communication, January 2001. Return to text. Podolok et al., Ref. 26, state that E/A ‘is consistent with 1 to the precision of the measurements.’; Pearl et al., Ref. 14 give E/A = 1.06 Â± 0.08, and E - A = 6% for Uranus. Return to text. Fix, J.D., Astronomy: Journey to the Cosmic Frontier, WCB/McGraw-Hill, New York, p. 286, 1999. Return to text. Samec, R., The age of the Jovian planets, CEN Technical Journal 14(1):3–4, 2000; p. 3. Return to text. Fix, Ref. 30, pp. 286, 287. Return to text. Fazio, C.G., Traub, W.O, Wright, E.L., Low, F.J. and Trafton, V, The effective temperature of Uranus, Astrophysical Journal 209:633–637, 1976; as cited in Hubbard, Ref. 10, p. 116. Return to text. 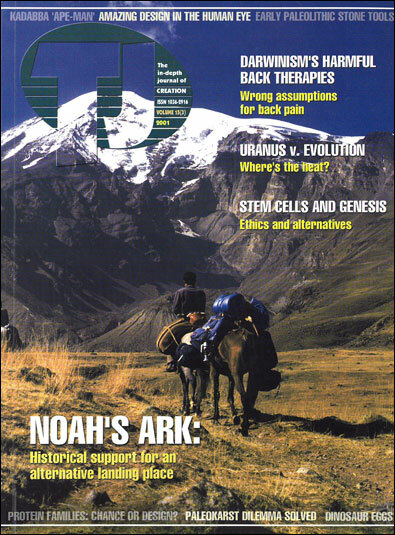 Ingersoll, A.P., Uranus, Scientific American 286(1):38–45, 1987; pp. 39–40. Though this article was published after the 1986 Voyager flyby of Uranus, the Voyager data had not been fully evaluated, and the assessment of Uranus’ thermal energy balance in this article reflects pre-flyby conclusions: ‘One of the goals of the Voyager 2 mission was to refine the rather uncertain estimate of Uranus’ internal heat. The calculation requires the analysis of a large number of observations, however, and it has not yet been completed’ (p. 40). Return to text. The source of heat from within Uranus, at <www.windows.ucar. edu/cgi-bin/tour.cgi?lin.../windows3.html&fr=f&sw=false&edu=hig>, 22 January 2001. Return to text. Uranus, Perth Observatory, at <www.wa.gov.au/perthobs/hpc2ura.htm>, 22 January 2001. Return to text. Uranus, Encyclopaedia Britannica, at <www.britannica.com/bcom/eb/article/printable/2/0,5722,118802,00.html>, 22 January 2001. Return to text. Fix, Ref. 30, p. 287. Return to text. Ouyed et al., Ref. 8, p. 371. Return to text. Fix, J.D., personal communication, 25 February 2001. Return to text. Diamond hail in Uranus and Neptune, Sky & Telescope 99(4):24–25, 2000; p. 24. Return to text. Kerr, R.A., Neptune may crush methane into diamonds, Science 286(5437):25, 1999. Return to text. Benedetti, L.R., Nguyen, J.H., Caldwell, W.A., Liu, H., Kruger, M. and Jeanloz, R., Dissociation of CH4 at high pressures and temperatures: diamond formation in giant planet interiors? Science 286(5437):100–102, 1999. Return to text. Benedetti et al., Ref. 43, p. 100. Return to text. Jonathan Henry earned his doctorate from the University of Kentucky in Chemical Engineering. He is now Chairman of the Science Division and Professor of Natural Science at Clearwater Christian College in Florida. He became an active creationist after reading Dr Henry Morris’ book Many Infallible Proofs. In 1987 he began speaking and writing in defense of ‘recent creation’ when his teaching schedule permits. He has authored The Astronomy Book published by Master Books. Return to text.